Visitors to Turks and Caicos mingle more often with tropical fish than they do with locals — that’s changing. Visitors to the Caribbean vacation island, however, tend to stay close to resorts, preferring to nurse poolside glasses of rum punch during their stays. Not that there’s anything wrong with that — resorts around the famed white sands of central Grace Bay are terrific. It’s just that many visitors leave the island having missed out on a gathering of the best local tastes in town, just a short cab ride away. Turks and Caicos is just an hour and half from Miami by plane. 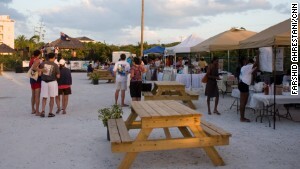 Launched in January, the island’s Thursday night Fish Fry is a weekly party that aims to get tourists mingling with locals. It takes place in a part of Providenciales (often called “Provo”) that most tourists don’t readily frequent. Island specialties such as jerk chicken, conch fritters, just-caught fish and an array of fresh seafood are cooked on the spot by the types of smaller vendors most tourists wouldn’t typically come across. The rum punch, too, is mixed in a way locals swear can’t be replicated by any hotel bar. A steel band punctuates the rhythm of a Junkanoo, a Bahamian-style dance and music parade. “Our goal is to get people out of their Grace Bay resorts and get them to experience our local food, culture and music,” says local tourist board representative David Fenimore, the brains behind the Fish Fry. Nobody ever needs to tell you to “just relax” here. Turks and Caicos is known for white sand beaches, turquoise waters, spectacular snorkeling and diving, and a heavy tilt toward high-end travelers. There’s a distinct separation here between locals and tourists, who tend to stick on or close to their resorts. 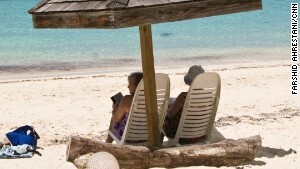 Longtime Providenciales resident Hazel Greenwood recalls a time when Grace Bay was nothing more than a raw stretch of beach, when expats (many of whom never left the island and became Turks and Caicos residents) and locals all knew each other and would often hang out together. “Tourists are not really aware of where we have come from to get to where we are, and it has been hard, but I’d say that what’s important here is that everyone does things together and we like to keep it that way,” says Greenwood, whose engineer husband put in the lights for the runway at Providenciales’ airport in 1983 and later wired up Club Med, the first luxury resort on Provo. At the Thursday fish fry, visitors can meet Provo personalities such as Melbourne Smith, creator of Henry the Conch, a Turks and Caicos mascot whose goal is to raise awareness of the cultural and ecological importance of conch to island. Another regular is the charismatic Alicia Wilson, who goes by the nickname “Beautiful” and is the creator of potent cocktails. Judging by the crowds lining up at stands like Blue Hills Native Cuisine, where owner Bertha Mae Forbes busily fries up vast quantities of fresh snapper, the word may be spreading faster than Fenimore expects. “We’re just using lime, some salt and a little bit of pepper,” says Forbes’ daughter, Marjorie Dorsett of her mother’s fish as it sizzles in hot oil. Tourists seem to be loving the local taste. “It’s a fantastic party — a great occasion for locals, expats and tourists to get together, and I’m definitely coming again,” says Robyn Matravers, a visitor from Toronto. 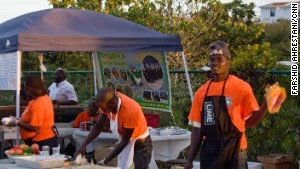 The Turks and Caicos Fish Fry takes place every Thursday from 5:30-9:30 p.m. at Bight Park, Lower Bight Road, Providenciales. A US$10-per-person taxi ride from any Grace Bay resort, it’s a family friendly event.